Football in Llandudno dates back to 1878 when a club,probably known as Gloddaeth Rovers were in existence probably for around a decade.the club was formed for the purpose of providing activity for cricketers during their close season.A full international Wales v Ireland was played on the "council field" in 1898. Llandudno were founder members of the Welsh National League(North)in 1921 and were champions in 1923 and League Cup winners in 1930.the club won the N.W.C.F.A.in 1926 and the North Wales Amateur cup in 1929.Controversy struck the club in 1931 when the F.A.W. instructed them to play in East Wales,which Llandudno refused and were suspended. 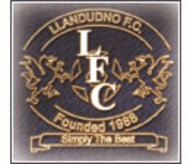 Llandudno were founder members of the Welsh League (North) in 1935 and remained in the league until war broke out in 1939 and the rejoined in 1945 and stayed till 1974. Llandudno were League champions in 1936 and repeated the feat the following season,in addition the club regained the North Wales Amateur Cup in 1948 and 1962,the Alves Cup in 1951 and the Cookson Cup in 1965. The club moved to it's current home at Maesdu Park in 1991after the "council field" was used for the construction of the ASDA store in the late 1970's. The current ground was officially opened in 1991 and floodlights were added in 1994.The following season saw the erection of a clubhouse and two small stands which provide seating(covered)for 130 spectators. The club has in the past few seasons gone under major transitions,with the addition of a new press box ,built by a local lad who died while construction was ongoing,and it is surely a testament to Cyril "Ciz" Williams that such a great number of freinds were determined to finish his work and the building stands as a fitting memorial to this wonderful man.In season 2004/05 new dressing rooms were completed and they have proved to be the envy of all who have used them, Last summer saw the erection of the new stands, with disabled access,the stadium now meeting the criteria set down for Welsh Premier football. During the summer of last year the clubhouse also had a complete makeover, with seating for 120 people. The club is moving forward every year, this season Llandudno FC have 2 under 8's an under11's, 12's 13's 2 under 15's and 2 under 17's.With it's expanding youth set up the future is indeed bright for the senior Welsh Club in the borough.